and then I go to sleep and wake up to see this. And now for some issues... now , clearly these need some balancing to do so im open for balancing suggestions, please comment on that. Secondly, requesting some help to those UFOPEDIA texts, i know they are pretty lame now and full of typos, so feel free to write better ones. But anyways, have fun ... i sure didnt have fun against mutons with these weaponery. Have you considered adding a "stun" function to existing rifle/shotgun style platform weapons? Tactical shotguns are now being seen with Taser slugs, though for a rifle I'd expect it to be an underslung firing implement or a melee function of the weapon. 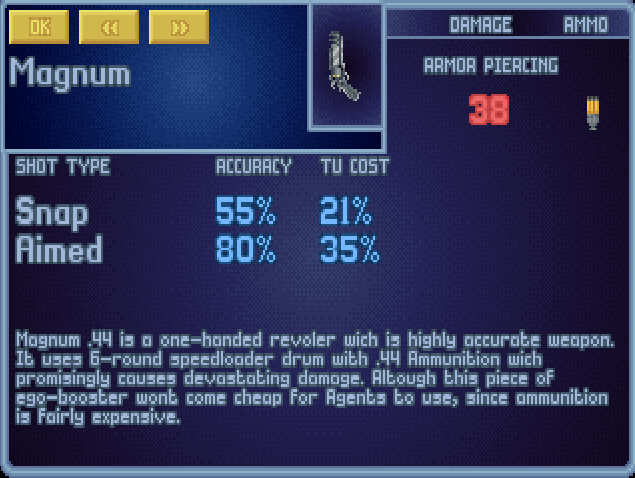 This lightweight weapon fires 5.8mm rounds (2 grams) optimized for the short combat ranges XCOM encounters in its fight with the alien threat. 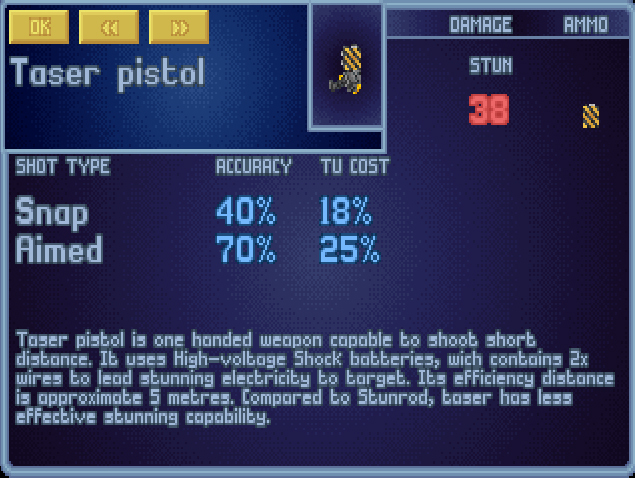 Fills the role of pistol and carbine easily, being able to be fired accurately with one hand. Ryseliini, these guns look amazing, great work! I am digging the hell out of these. Thought I'd have a go at the UFOpedia texts. This precision magnum's mule-like kick is nothing compared to the force it delivers on the business end. It fires .44 caliber rounds in rubberized 6-slot speedloader cartridges, each literally worth their weight in gold. Don't call it a sidearm. 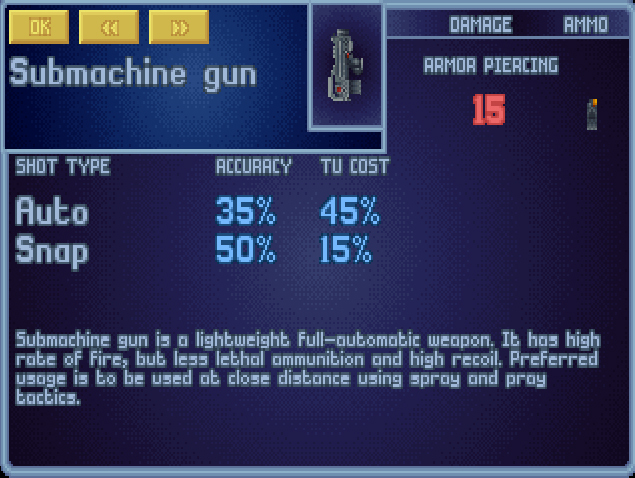 This lightweight, gas operated Submachine gun spits .45 ACP rounds at a blistering rate. The streamlined design grants satisfying ease of use, but crude sights and aggressive recoil inhibit long-range accuracy. 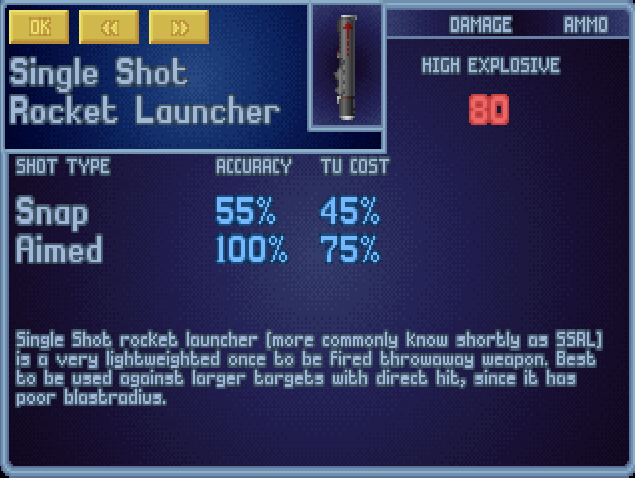 An X-Com-special take on the classic disposable RPG, capable of accurately penetrating armored targets. Its shaped charge payload is built for penetration rather than explosivity, requiring a direct hit for optimal results. A non-lethal weapon derived from a very recent police design, capable of incapacitating targets up to 5 meters away. While it delivers a less powerful charge than blunt-force stun weapons, its stylish pistol grip grants easy handling, and the range alone makes it a worthwhile asset. A heavier variant of the custom-designed X-Com rifle. The extra weight comes from a heavier barrel and integral bipod system, capable of facilitating heavy fire on medium-to-short range targets. Powerful recoil and obtuse handling make it unsuitable for longe-range shooting. Wow, you are really good at this!